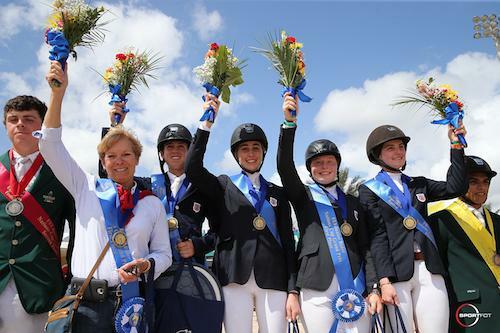 Wellington, FL - March 2, 2016 - The 2016 Winter Equestrian Festival (WEF) is host once again to Nations Cup competition on March 3-6 at the Palm Beach International Equestrian Center (PBIEC). The week will feature international competition for riders of all ages with the $150,000 Nations Cup on Friday, March 4, as well as the Hollow Creek Farm Children's, Junior, and Young Rider Nations Cups on Saturday, March 5. Top international show jumpers return to the main International Arena on Sunday, March 6, for the $216,000 Lugano Diamonds Grand Prix CSIO 4*. The Winter Equestrian Festival is in its eighth of 12 weeks of competition, and the circuit awards more than $9 million in prize money. The $150,000 Nations Cup on Friday night will feature seven teams battling to see whose flag will be raised in victory. Countries expected to field teams are: Brazil, Canada, Colombia, France, Ireland, Mexico, and the United States of America. This is the 15th edition of the Nations Cup at WEF, and everyone is welcome to come and cheer on their favorite team and show their national colors. Can the United States make it two wins in a row? General admission and general seating are free! On Saturday, the first rounds of the Hollow Creek Farm Children's, Junior, and Young Rider Nations Cups will take place during the day. Teams then return for the second round starting at 5 pm to see who will top the podiums. General admission and seating are free. In the Hollow Creek Farm Children's Nations Cup, teams are fielded from Argentina, Brazil, Canada, Colombia, Denmark, Ecuador, Ireland, Mexico, and the United States. Eight teams will compete in the Hollow Creek Farm Junior Nations Cup, including: Argentina, Brazil, Canada, Colombia, Ecuador, Ireland, Mexico, and the United States. For the Hollow Creek Farm Young Rider Nations Cup, there will be teams from Brazil, Ireland, Mexico, and the United States. Come out to PBIEC on Saturday for one of the most fun days of the year! Cheer on teams of riders for the next generation of international show jumpers. Last year, the United States had a full sweep of all three Hollow Creek Farm Nations Cups as well as the Senior Nations Cup. Looking for a VIP experience this week? For a hospitality seating package for Friday through Sunday, please contact patti@equestriansport.com or call 561-784-1125. Availability is limited so book your VIP weekend soon!